A native of Columbus, Ohio, Minnita Daniel-Cox attended Bowling Green State University where she received a Bachelor of Music in Music Performance. Upon completion of her baccalaureate studies, she attended The University of Michigan where she received her both her Master of Music and her Doctorate of Musical Arts degrees. Most recently, Dr. Daniel-Cox performed an American Music Recital tour in Bulgaria and has been a featured soloist with the Dayton Philharmonic Orchestra, Springfield Symphony Orchestra, Miami Valley Symphony Orchestra, and Bach Society of Dayton. 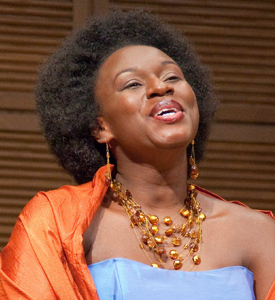 Two of her notable roles have been Sister Rose in Heggie’s Dead Man Walking and Anna Gomez in Menotti’s The Consul, both performed with Dayton Opera. She has appeared with the University of Dayton, Yellow Springs, Flint, Ann Arbor, and South Bend Symphony Orchestras as well as the Defiance and Packard Symphonic Bands. Her research regarding the musical settings of texts by poet and Dayton native, Paul Laurence Dunbar led to her establishment of the Dunbar Music Archive. Dr. Daniel-Cox has a passion for teaching and has taught music courses or applied voice for programs at Western Michigan University, University of Michigan, Bowling Green State University, and within the award-winning music program at Grosse Pointe South High School. After serving four years as Artist-in-Residence, Dr. Daniel-Cox is now Assistant Professor of Voice and Coordinator of the Voice Area at the University of Dayton where she teaches applied lessons, music courses, serves as Artistic Director of the yearly musical/opera productions, and coordinates the Vocal Performance Institute, a summer program for high school aged singers.